Discussion in 'Feedback' started by Matt, Apr 23, 2015. 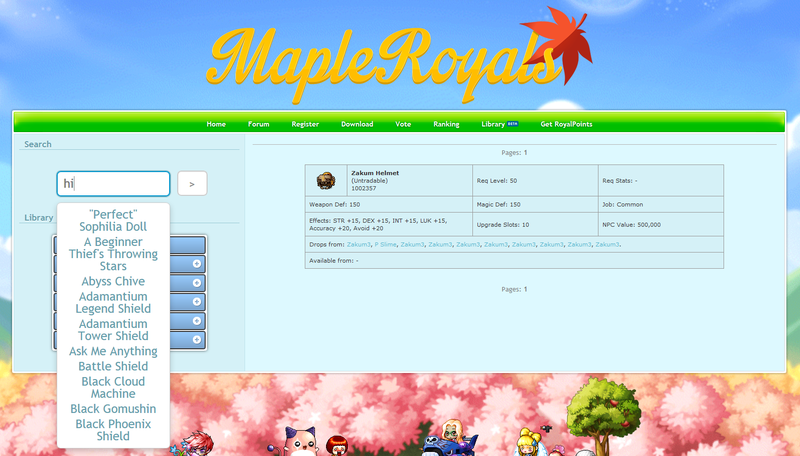 This is a feedback thread for the MapleRoyals library (https://mapleroyals.com/library). It is still a work in progress, the aim at the moment is to get basic item and monster information done so that it is a completely accurate database for the players to use to find out where they can obtain certain items or see what a monster drops. Further detailed information about quests, shops, monster data will come at a later date. Probably once we have settled into the new source. We have decided to release it in it's early stages since the main features of it are functional enough for it to be used. You can now find the link to it on navigation bar on the main website. MapleBishopFan1985, SaintedMal, Thom and 2 others like this. Really glad to see the monsters implemented into the library! Looking forward to the quest section! Will you add in places that items can be crafted? E.g., Work Gloves: "Synthesized by JM from tha Streetz with 15 Leathers and 1,000 mesos." Thanks, we've only gone through the equips so far to get rid of things. 4198 equips were removed in total from the library in total, now 4201 when including your submissions. We'll be doing the other items in the near-ish future. Probably yes, but we will likely just have Synthesised by JM from that Streetz, with a link to the NPC. Here's some items I noticed that probably shouldn't be included. Not all of them are visible when browsing, but show up in search results. Weapon types for newer classes, see Great Swords (item IDs 1542xxx) and Fans (item IDs 1552xxx). There might be other new weapon types like this, but I'm not familiar enough with their names to know what to search for. It might be nice to be able to see the type of item (helmet, potion, bow, etc.). It would be stupidly redundant if you browsed to the item through the categories, but handy when looking at search results. This could either be done as a new field within the item's info (which would work better for search results), or as a breadcrumb above the item Hidden Street style (which would only work for single items). Either one of those solutions could be a link to bring you to that item type. The search box autocomplete results font is pretty huge on all of my browsers, especially compared to the library's default font (pic). Also, having the text centered in the search makes it pretty tough to read, in my opinion. When there's only one search result, the URL could redirect from the search results to that item's page. When there's only one page of items to display, the page doesn't need to say 'Pages: 1'. Of course, I wouldn't expect anything more than that. Just that alone is helpful. MapleBishopFan1985, Gags and Michael like this. Eventually adding in ToT mobs and spawn location? For The monsters tab Can you put what map the monster is located in? - When browsing the monsters pages, the 'Equip drops', 'Use drops' & 'Etc drops' walls of text are too much in your face. I think the focus should be primarily on which monster you're looking at (bigger mob name?). Sorry, I just can't stand looking at them. Description: Improves DEX on headwear..Success rate 70%, DEX+2nIf failed, the item will be destroyed at a 50% rate. 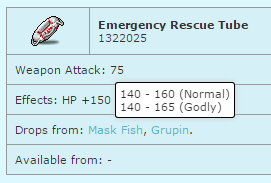 Description: Improves DEX on headwear..Success rate 30%, DEX+3nIf failed, the item will be destroyed at a 50% rate. Description: Improves LUK on earrings..nSuccess rate:70%, LUK+2nIf failed, the item will be destroyed at a 50% rate. Description: Improves LUK on earrings..nSuccess rate:30%, LUK+3nIf failed, the item will be destroyed at a 50% rate. Description: Improves HP on earrings..nSuccess rate:70%, MaxHP+15nIf failed, the item will be destroyed at a 50% rate. Description: Improves HP on earrings..nSuccess rate:30%, MaxHP+30nIf failed, the item will be destroyed at a 50% rate. Description: Improves luck on topwear..nSuccess rate:70%, LUK+2nIf failed, the item will be destroyed at a 50% rate. Description: Improves luck on topwear..nSuccess rate:30%, LUK+3nIf failed, the item will be destroyed at a 50% rate. Description: Improves strength on overalls..nSuccess rate:70%, STR+2, weapon def.+1nIf failed, the item will be destroyed at a 50% rate. Description: Improves strength on shields..nSuccess rate:70%, STR+2nIf failed, the item will be destroyed at a 50% rate. Description: Improves strength on shields..nSuccess rate:30%, STR+3nIf failed, the item will be destroyed at a 50% rate. Description: Improves strength on Maple Cape.nSuccess rate:20%, STR+3 nIf failed, the item will be destroyed at a 30% rate. Description: Improves INT on Maple Cape.nSuccess rate:20%, INT+3 nIf failed, the item will be destroyed at a 30% rate. Description: Improves dexterity on Maple Cape.nSuccess rate:20%, DEX+3 nIf failed, the item will be destroyed at a 30% rate. 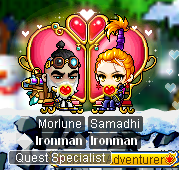 Description: Improves luck on Maple Cape.nSuccess rate:20%, LUK+3 nIf failed, the item will be destroyed at a 30% rate. Description: Improves accuracy on one-handed swords.nSuccess rate:70%, accuracy+3, DEX+2, weapon att.+1nIf failed, the item will be destroyed at a 50% rate. Description: Improves accuracy on one-handed swords.nSuccess rate:30%, accuracy+5, DEX+3, weapon att.+3nIf failed, the item will be destroyed at a 50% rate. Description: Improves accuracy on one-handed axe.nSuccess rate:70%, accuracy+3, DEX+2, weapon att.+1nIf failed, the item will be destroyed at a 50% rate. Description: Improves accuracy on one-handed axe.nSuccess rate:30%, accuracy+5, DEX+3, weapon att.+3nIf failed, the item will be destroyed at a 50% rate. Description: Improves accuracy on one-handed blunt weapon.nSuccess rate:70%, accuracy+3, DEX+2, weapon att.+1nIf failed, the item will be destroyed at a 50% rate. Description: Improves accuracy on one-handed blunt weapon.nSuccess rate:30%, accuracy+5, DEX+3, weapon att.+3nIf failed, the item will be destroyed at a 50% rate. Description: Improves accuracy on two-handed swords.nSuccess rate:70%, accuracy+3, DEX+2, weapon att.+1nIf failed, the item will be destroyed at a 50% rate. Description: Improves accuracy on two-handed swords.nSuccess rate:30%, accuracy+5, DEX+3, weapon att.+3nIf failed, the item will be destroyed at a 50% rate. Description: Improves accuracy on two-handed axe.nSuccess rate:70%, accuracy+3, DEX+2, weapon att.+1nIf failed, the item will be destroyed at a 50% rate. Description: Improves accuracy on two-handed axe.nSuccess rate:30%, accuracy+5, DEX+3, weapon att.+3nIf failed, the item will be destroyed at a 50% rate. Description: Improves accuracy on two-handed blunt weapon.nSuccess rate:70%, accuracy+3, DEX+2, weapon att.+1nIf failed, the item will be destroyed at a 50% rate. Description: Improves accuracy on two-handed blunt weapon.nSuccess rate:30%, accuracy+5, DEX+3, weapon att.+3nIf failed, the item will be destroyed at a 50% rate. Description: Improves accuracy on spears.nSuccess rate:70%, accuracy+3, DEX+2, weapon att.+1nIf failed, the item will be destroyed at a 50% rate. Description: Improves accuracy on spears.nSuccess rate:30%, accuracy+5, DEX+3, weapon att.+3nIf failed, the item will be destroyed at a 50% rate. Description: Improves accuracy on pole-arms.nSuccess rate:70%, accuracy+3, DEX+2, weapon att.+1nIf failed, the item will be destroyed at a 50% rate. Description: Improves accuracy on pole-arms.nSuccess rate:30%, accuracy+5, DEX+3, weapon att.+3nIf failed, the item will be destroyed at a 50% rate. Description: Improves accuracy on knuckles.nSuccess rate:70%, accuracy+3, DEX+2, weapon att.+1nIf failed, the item will be destroyed at a 50% rate.. Description: Improves accuracy on knuckles.nSuccess rate:30%, accuracy+5, DEX+3, weapon att.+3nIf failed, the item will be destroyed at a 50% rate.. Description: ??? ?? ??? ??? ?? ?? ? ?.nSuccess rate:40%,weapon att.+3,STR+2nIf failed, the item will be destroyed at a 30% rate. Description: ??? Canon ??? ??? ?? ?? ? ?.nSuccess rate:40%, weapon att.+3,naccuracy+2nIf failed, the item will be destroyed at a 30% rate. Description: Recovers the lost number of upgrades due to failed scroll by 1. Not available on Cash Items.nSuccess rate:1%, If failed, the item will be destroyed at a 2% rate.. Description: Recovers the lost number of upgrades due to failed scroll by 1.nSuccess rate:3%, If failed, the item will be destroyed at a 6% rate.. Description: Recovers the lost number of upgrades due to failed scroll by 1.nSuccess rate:5%, If failed, the item will be destroyed at a 10% rate.. Description: Recovers the lost number of upgrades due to failed scroll by 1.nSuccess rate:20%, If failed, the item will be destroyed at a 50% rate.. Yes I went through all 22 pages. Home is where the heart is c: Be a Homie, Today! Is this HP range true? Seems different from all the other ranges of 150. This has a normal range of 10, whereas something like Elemental Wand 5-6 have a range of only 5. Does it only apply to HP items? Thanks for the feedback. Most - if not all of the comments are things we will be sorting out. In particular I'll be removing the mentioned Equips from the search shortly. I think we may have them say 'This item is available from Gachapon' but not actually say which Gachapon. Don't want to make it too easy for everyone. The monster levels/exp are currently not from our data, just something I threw together quickly using information from elsewhere. We will be sorting that out in the near future and making sure all monster data is accurate including their HP etc. Yes - eventually there will likely be information about the item if the item is not available year-round. This is also something we do want to add, but this won't be happening for a while yet. The main aim was to just get the monster drops accurate. Regarding the equips, we will likely have something like that, possibly a dropdown menu to quickly change to another weapon type. And the monster info/styling will be sorted out in the future probably. If anyone has any ideas on how to make the lists of items in the Monsters section look better feel free to give your opinion. Separated by comma's instead? More columns? Some sort of mouse-hover information? Wow thanks a lot. Seems like typo's on Nexons part as the n's should be \n to do a new line. I'll try to get this sorted out at some point. The item stat ranges should be 100% accurate as to what is available in game as the formula used is the same as the one in the game. Cyndy and Spooky Business like this. Health points and mana points have greater natural ranges than other statistics, yes. Are the specific monster cards going to be added with the new source, or are they going to be removed from the library? Also, I see red slime was removed (as Neo Tokyo isn't implemented) but silver slime is still in there. And supposedly it drops the sky ski. Would it be possible to add searching for everything, both monsters and items? If adding all entries into the library is unnecessarily time consuming, perhaps bring on a small group of people willing to fill out the missing spots, as well as remove ones that shouldn't be. Just thought I'd let people know I'm way too busy helping sort out the new source at the moment so library updates/fixes will be on hold for now. Cyndy and Andreas like this.